Overview--This shop focuses MUCH more on the Ganassi/Sabates era of the ownership group (as opposed to the Earnhardt Ganassi period). Still, there's plenty going back to the Kyle Petty/Mello Yello days, especially trophies. Additionally, there's some information and souvenirs from Chip Ganassi's open-wheel and sports-car teams, although they are not based here. To See and Do: 4 this shop didn't have much activity going on while I was there. 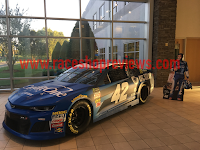 They really seem to have virtually every trophy they've ever won on display, as well as Jamie McMurray's Daytona 500 & Brickyard 400 winning cars. 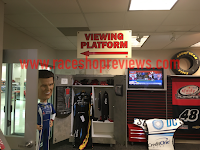 This shop shows off items that you don't get to see at other shops--a sample toolbox, actual firesuits you can touch, et cetera, in the gift shop. The best days to go are Tuesdays and Wednesdays. Accessibility: 4 a glass window separates you from the garage, but its so huge that you can see everything. 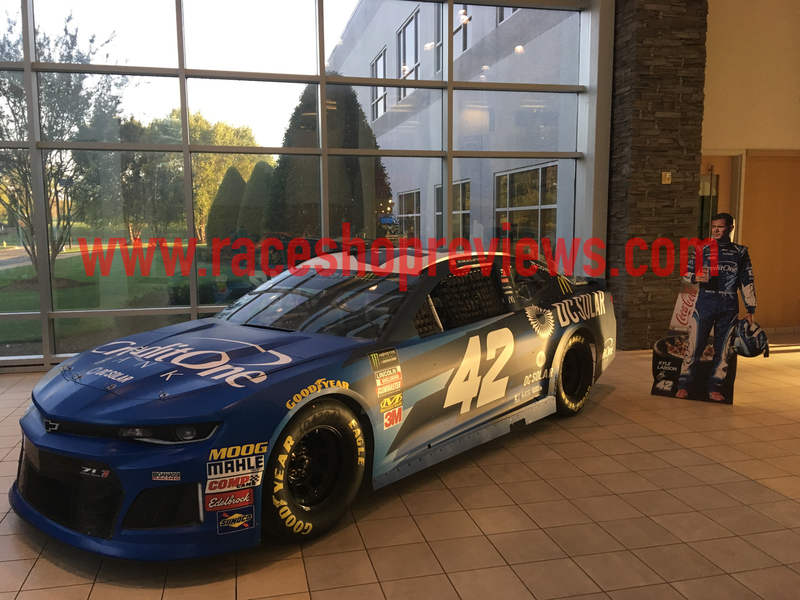 This is another shop that uses the area right by the glass for show cars, so its tough to get an up-close view of any work being done. Gift Shop: 5 LOTS of stuff to buy, and its laid-out in a cool team locker room motif. There's also merchandise to buy from Chip Ganassi's IndyCar teams. Friendliness of Staff: 4 not that many people there, but the clerk at the gift shop seemed very friendly. Insider Tip: There is a 2nd floor to the viewing area that is somewhat hidden. 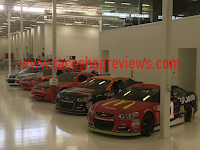 You have to go through the gift-shop to get there, its to the left of the locker with the firesuits. Insider Tip: Ask the gift shop staff if there is pit practice going on that day, as it is open to viewing. Insider Tip: Their Xfinity team is also based here, generally on the right side of the shop as viewed from the viewing area. Final Verdict--See it, a great shop for a mid-level team.